Free Shipping Day on December 18, 2013 + Deadlines! Last year Thanksgiving was a week earlier which meant a week extra to prepare for Christmas. I could definitely use an extra week this year! Time is running out, and the shipping deadlines are fast approaching. Luckily, tomorrow December 18, 2013 is Free Shipping Day and many online stores are participating. 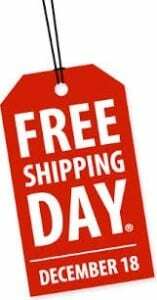 Over 800 retailers and counting are offering free shipping on Wednesday, no matter the order size or price! This is a great opportunity to get some shopping done without leaving the house! For more information or to see all participating retailers, please head here. Also, this week is the deadline for most retailers for (free) shipping, so make sure to get your orders in. Today is the last day for free shipping for non-prime orders at Amazon. Saturday, 12/21/13 is the deadline for Prime orders. For more information about Amazon Prime or to sign-up for a trial offer, please head here. Both Target and Walmart seasonal/free shipping ends on Thursday, December 19th!